To make the barbecue sauce, remove the pits from the plums and give them a rough chop. Don't peel them. Put them in a medium pot and add the lemon juice, brown sugar, garlic, ginger, plum sauce, vinegar, ketchup, hot sauce, soy sauce, tamarind paste and 1/2 tsp salt. Bring to a boil and boil gently for about 30 minutes, stirring often, until thickened. Take off the heat and blend with an immersion blender if you want a smoother texture. Taste it and see if you want to add more of anything. Let cool and then store, tightly covered, in the refrigerator. This recipe makes extra sauce, it will keep for a month. Set the oven to 450F. Line a baking sheet with foil or parchment paper. Spray lightly with cooking spray. 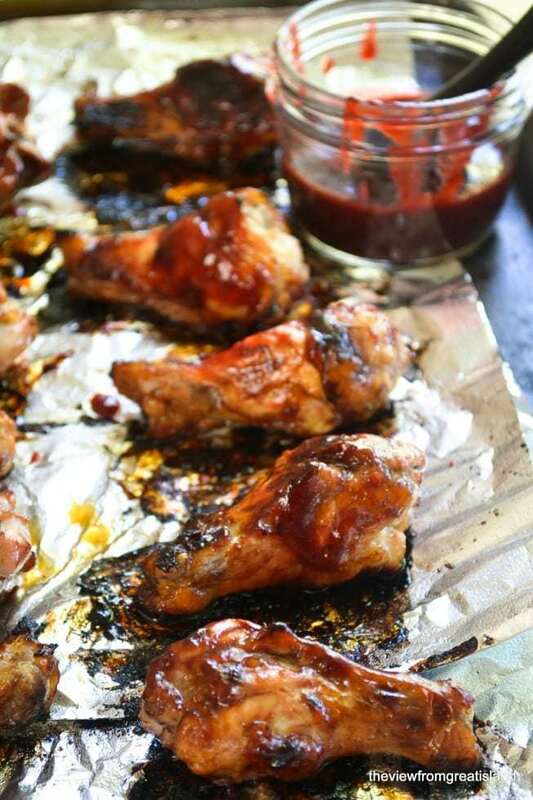 Sprinkle the drumettes with a little salt and black pepper, and then toss with barbecue sauce to lightly coat them. Lay them out on the baking sheet and bake for 30 minutes, giving them a turn once or twice to prevent sticking and let them brown evenly. Remove from the oven and brush more sauce on the meat. Serve hot or cold, with a little more sauce on the side.